With this being the first holiday since my mom died, I decided a simple Thanksgiving at home alone would do me some good. Mom’s been gone for a little more than two months. Not being able to call her and talk has been the hardest adjustment since then, especially when it comes to cooking. My mom gave me the confidence to cook when I was young and served as a sounding board whenever I tried cooking something new. And she made the best homemade noodles you’ll ever eat. I don’t like kneading dough, so I never tried to make her noodles, though when I told her about the Amish store near my property in Charlotte, Tenn., she told me that her family’s noodle recipe came from the Amish and I could probably buy dried noodles there and just cook them in chicken broth to get the same result. 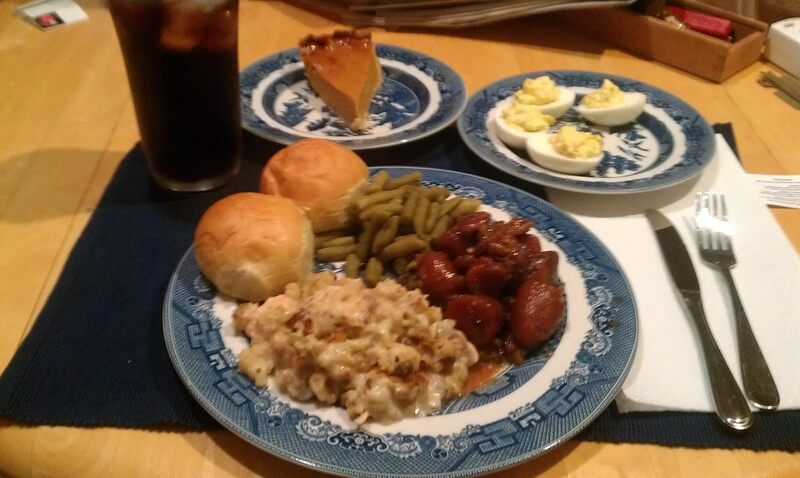 This year, I opted for a simple dish I first had when Carolyn’s aunt made it for us one Sunday. Technically, it’s chicken casserole, but it uses stuffing on top, so it smells like Thanksgiving, which is what we always called it. Bring water to boil in a medium sauce pan, add stuffing mix, stir just until moistened, remove from heat and set aside covered for 5 minutes. Place chicken pieces in 13×9-inch baking dish. Mix soup and milk in a bowl until blended; pour over chicken. Bake 30 min. or until chicken is done. This makes enough to feed 6 people. I haven’t figured out yet how to half the soup, so I have plenty of leftovers. Put the yams in the bottom of a shallow baking dish and pour the syrup mixture over the yams. Cook for 25-30 minutes in a 350-degree oven. Since I had two dished to bake today, I set the thermostat at 375, pulled the yams out after 25 minutes and upped the temperature to 400 for the last 5 minutes for the chicken. They came out well. I heated up a small can of green beans in chicken broth and made deviled eggs while the other stuff was in the oven. Store bought bread and a slice of pumpkin pie I baked last night made a meal my mom would be proud of. They made sense to him because he’d heard someone else sing them before. We didn’t have the internet back in the day and WTIX didn’t play them on the AM radio. We just thought he made them up. And he kind of did, because he would change the words to fit his mood or whatever he found funny at the time and they rarely had the exact same lyrics each time he sang them. He still sings them today. But I digress. I was singing one of my dad’s versions of Sugar Foot Rag this afternoon. I bought a little jig, a Kreg jig, to be exact. Kreg makes lots of jigs. I first saw them on TV 10 or 15 years ago and thought it would be a great tool for someone like me. My brother has helped me learn, though. Once he suggested I buy a long 1×4 and two c-clamps to use with my circular saw, rather than spend all kinds of money on a table saw. In a day, I was ripping the straightest cuts ever. I picked up a little Kreg jig at Lowe’s (Model R3) and used it to attach a base to my homemade TV antenna. I’ve been wanting to add a base to my antenna for five years. But while my brother’s advice on straight-edges empowered me to install attic flooring several years ago, his advice on attaching a base to the long wooden pole I use for my antenna wasn’t as empowering. “Just drill some holes through the base and countersink some screws,” didn’t have the same effect. I had a vision of the 7-foot plus thing toppling over because I didn’t countersink enough. So it has sat on a back burner for a while. Watching the Woodsmith’s Shop yesterday reminded me that the Kreg jigs could help me. And I discovered that I could do it with a smaller, portable jig that didn’t cost $100. If you want the generic name, it’s called a pocket-hole jig. Portable comes in handy when you live in an apartment and your workshop is 50 miles away, like mine is up on the ridge. So on the way home after a rainy-day visit to the ridge today, I stopped at Lowe’s to look at things I need for this coming weekend on the property and picked up the R3 jig and a 2-foot long piece of oak 1×12. As soon as I got home, I did a little jig and zigged a little zag, and within 5 minutes I had a nice looking 90-degree connection between the antenna post and the base. It’s not finished. I want to add some stiffeners at the base and then seal the wood and drill some holes to permanently attach the antenna top. But it’s operational and ready for the next Saturday that I decide to just lay on the couch and watch the Saturday DIY home improvement and cooking shows on PBS and the TV signal acts up. One foot, two foot, slew foot drag, build your own antenna with the Sugar Foot Rag …. What do you get when you take a boy from the bayous and swamps of Louisiana and transplant him to the hills and hollows of Tennessee? This blog will attempt to chronicle such a life.